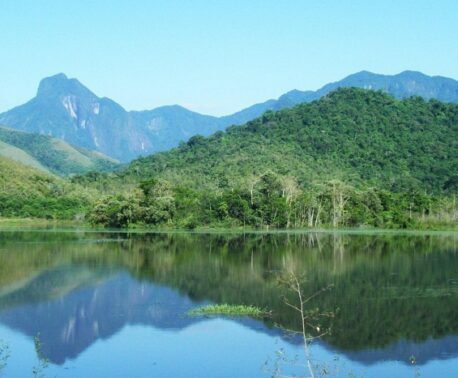 In March 2013, a group of World Land Trust (WLT) representatives organised a birdwatching trip to Ecuador. The party consisted of Nigel Simpson, WLT Trustee, Kevin Cox and Alan Martin, both Council Members and Renton Righelato, former Chairman of Trustees. 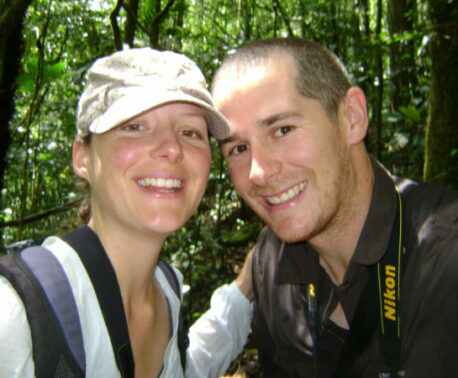 The group stayed at a number of reserves supported by WLT donations, now owned and managed by Fundación Jocotoco (FJ). Nigel, Kevin, Alan and Renton were joined by Dr Niels Krabbe (a Board member of FJ, and co-author of The Birds of the High Andes) and Francisco Sornoza (Conservation Director and first Chief Executive of Fundación Jocotoco). They travelled at their own expense. This is an extract of Nigel’s account of the visit. We were met by two rangers, Luis and Silvio, from the local community of Yanacocha. Although a rather cloudy, misty day, it was fine for birdwatching and seeing the reforestation work in progress. Swordbills, Scarlet-bellied Mountain Tanagers, other colourful mountain tanagers, splendid views of Ocellated Tapaculo, and Tawny Antpitta (at a worm-feeder) were some of the highlights. We were disappointed not to see the critically threatened Black-breasted Puffleg, a flagship species of this reserve and emblem of Quito. After lunch we drove up to the high-paramo sector of the reserve at about 4,000m where the condor feeder is located, and where Niels ‘rediscovered’ the Imperial Snipe in 1988. Polylepis trees have been planted up here also. Bleak and cold but very impressive scenery with the huge ice-cap on the volcano clearly visible. Stopped to see Chimborazo Hillstars – a species of hummingbird that is found in grassland, scrub and stunted woodland at altitudes of 3,500 to 5,200 metres (11,500 to 17,100 ft). 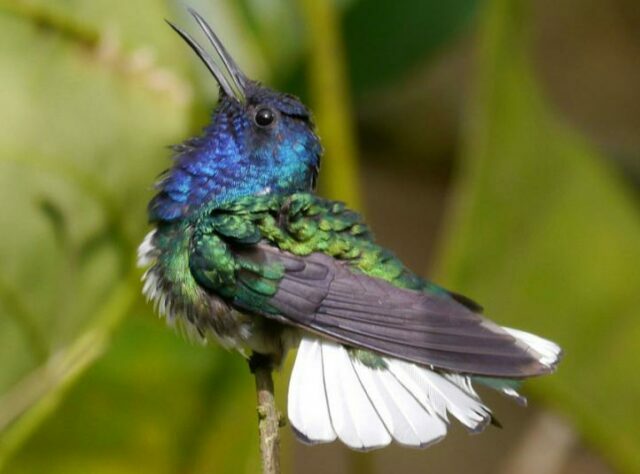 The Chimborazo Hillstar, also called the Ecuadorian Hillstar, is the highest living of all hummingbirds, and no other species of hummingbird occurs at higher altitudes in the Andes of Ecuador. On the high plateau were many Carunculated Caracaras, Paramo Pipit and a dozen or so Andean Condors including a party of five birds feeding on carrion in the distance. We visited the famous Hacienda Antisana in the foothills of the volcano. The reserve, now owned by the Government and the City of Quito, is adjacent to the heritage site of Humboldt’s Cabin where naturalist and explorer Alexander von Humboldt worked. Here we saw a Barn Owl! A large number of the Black-faced Ibis were present (more than 30), Bairds Sandpipers on migration, Andean Lapwings and Gulls. Giant Hummingbird on the feeder at the visitors lodge at Guyatara. We then began our journey to Jorupe Reserve, in the south-west of Ecuador, stopping off en route at the Buenaventura Reserve which is a hybrid habitat comprising both Chocó and Tumbesian biomes. The climate here is controlled by the cold Humboldt Current whose track north from the Antarctic fades out just north of the Ecuador border. This is the area where the El Nino climate event first makes itself apparent. The hummingbird feeders around the Buenaventura Umbrellabird Lodge were very busy – with up to 200 birds buzzing around – mainly Green Thorntails and White-necked Jacobins, but about 15 species in all. We stayed three nights and walked and drove to different parts of the reserve. We saw Long-wattled Umbrellabirds busy at their lek (mating display). Club-winged Manakins at leks also. Toucans, Parrots, motmots, aracaris, numerous tanagers in abundance. Elegant Swallow-tailed Kites on migration circling low over the forest and the lodge for much of the time. Both the specialities of the reserve – the El-Oro Parakeet and the El-Oro Tapaculo – were spotted after some effort. Grey-cheeked Parakeets and Grey-backed Hawk were two other globally threatened species seen, as well as Rufous-headed Chachalaca. We were able to see some of the first trees planted in the reforestation program. Planted as seedlings in November 2004, they are now 15 metres tall with a good coating of epiphytic plants on them. The insect life – especially large moths – was impressive each night. Hawk moths, and one moth apparently with the world’s largest wingspan, and splendid cicadas and Praying Mantis, and Morpho Butterflies. Howler Monkeys were calling at dawn and dusk. Due to a lack of time we were unable to visit the Yunguilla Reserve where there is a small but thriving population of Pale-headed Brush-Finches, once thought to be extinct but ‘rediscovered’ in 1998. We arrived at Jorupe Reserve and the Urraca Lodge after about six hours travel, including minor waits along the way for landslides to be cleared, and army (border) checkpoints.. At the end of the day we went to see a day-roost of the large Spectacled Owl. 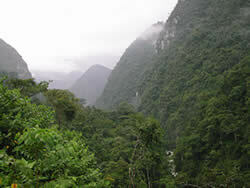 Jorupe is in the Tumbesian which stretches from the SW corner of Ecuador south into much of north west coastal Peru. Breakfast at Jorupe is quite an event as rangers put out corn for feed in front of the dining room. As predicted, a flock of about 20 Red-masked Parakeets and several large handsome Guayaquil Squirrels arrived, then a Pale-browed Tinamou. This bird is often heard and seldom seen, so it is quite an attraction. Last bird on the feeding list was the attractive White-tailed Jay, known locally as the Urraca which the visitor lodge is named after. About three or four arrived for the corn. A King Vulture obliged by flying over, as did three large Hawks – Savannah, Harris’s and Zone-tailed. Threatened species seen included Rufous-necked and Henna-hooded Foliage Gleaners, Rufous-headed Chachalaca, Blackish-headed Spinetail, plus local specialities, Watkins Antpitta, Tumbes Hummingbird, and Bairds Flycatcher. We went out at night to try and hear the very rare Buff-fronted Owl, which had recently visited the lodge dining room, but with no success. The deciduous forest was in full leaf as it was the wet season. The huge pale-green trunked Ceiba (kapok) trees are the signature species here. The lodge facilities are carefully positioned around these in the forest and offer wonderful views. After a drive of more than six hour drive north east across the Andes Continental Divide (twice), we came to Tapichalaca Reserve, the first reserve established by FJ to this protect cool, wet cloud-forest habitat for the newly discovered Jocotoco Antpitta. After Loja (which is in the Amazon drainage) we climbed a pass once more into the Pacific side. After a break in Vilcabamba we continued south. At Yangana village we stopped to socialise with several local families many of whom have had involvement with FJ for several years. Most of the Tapichalaca land purchases were made from Yangana based farmers, and most of the reserve rangers have their homes there. Wet temperate forest in Tapichalaca Reserve on the east slope of the Andes. © Nigel Simpson. We were welcomed at the Casa Simpson Lodge (built in 2000) by Byron the Administrator, Franco and Vicente (rangers), and the catering staff. We spent three nights there. On the first morning the main event was to see the Jocotoco Antpittas at the feeder. They performed perfectly with Franco Mendoza the Head Ranger providing the encouragement. The two adults and two young birds (out of nine young raised so far) appeared. The first day we had a slow wander through the cloud forest followed by a longer stop at a ridge top with views in all directions. An Andean Potoo had its day perch there. A Dusky Piha was another rare visitor to the spot, together with endangered Golden-plumed Parakeets and two threatened Bearded Guans. We spent the next day on the lower slopes of the reserve at about 2,000m altitude where a different set of species resides. This is also the main area for FJ tree planting and large areas have been restored over the past six years. Globally endangered White-breasted Parakeets arrived in the evening to roost in nest boxes provided for them – about a dozen birds in all. This was also a chance to have a look at the road-expansion work now taking place along this section, near and below the lodge. At the bridge over the river at Valladolid village, we had a good sighting of Andean Dipper and Torrent Duck. On the final day, we also travelled further south of Valladolid to altitudes of about 1,500m, where we saw another set of species, including yet more varieties of multi-coloured tanagers. Very little forest remains in these warmer sunnier climes – just a few fragments, the rest having been cleared for pasture. The final highlight of the trip, on the final day, a rare Andean Paca came for some food from outside the kitchen. We had a very successful and enjoyable visit. We saw nearly 400 species of birds and a wide sample of conservation work supported by World Land Trust in partnership with Fundación Jocotoco. The travel arrangements were complex, but worked out perfectly and we were received with great hospitality from both colleagues at Fundación Jocotoco and the people we came across on our travels.